Ramblings of an Impatient Artist: Snow Day! Today, I'm bringing you a little digi delight in the way of Cozy Ian! I'm a huge fan of digi stamps - they're so versatile - you can make them bigger to fit scrapbook pages, or leave them their original size for cards or whatever else you can think of! There's soooo many adorable digi images at the Greeting Farm - you'll want them all (I know I do!). Ian is printed on Xpress Blending Cardstock and colored with my fav - Copics. A rubber band bracelet my daughter made me inspired the colors - BG01-BG07 and YG01-YG06. 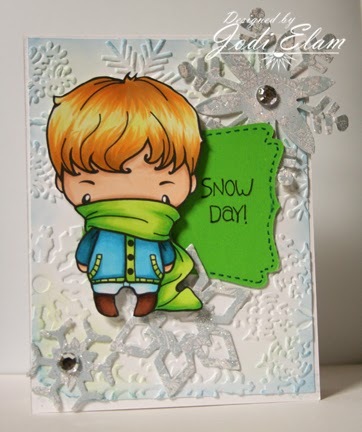 The background is embossed with a Cuttlebug Snowflake embossing folder and edged with Pebbles Inc.chalks. Hope you enjoy and I hope Ian encourages you to try out some digi stamps!